When I first saw that Outfest was pairing up these shows, I was confused. Had they run out of time and needed to squeeze two into one? But when I watched the series, back to back, I realized Outfest had seen what I could not. They found the shows evoked the same general feelings about womanhood, community, and self-discovery. I’m very glad to having been out at Outfest with Strangers and Féminin/Féminin. There’s a sensation, the day we wake up and find out we are strangers to ourselves. It’s something many queers have felt, under the ongoing onslaught of heteronormativity, that we are somehow different, possibly wrong, and we don’t really feel comfortable in our own skin. It’s in those moments, or days, or even years, where we find our tribes. The people who become a family, no matter how far apart we live, who build us up, who hold us when we cry, and who remind us that being strange is actually what normal is. That feeling, of being alone inside and finding who we are, with or without our friends, is what Strangers and Féminin/Féminin have in common. The two series are wildly different in their approaches to community, to finding one’s self, and to what being queer means. But at their heart, they remain the same. Stories of women helping each other, imperfectly, told by women, and shared with us all. Strangers, an webseries that airs on Facebook, is about what happens when you let strangers into your life. Literally. But it’s also about about discovering the stranger in your best friend and sometimes in yourself. In season one, struggling writer Isobel, a bi-racial bisexual, opens her doors, if not her heart, as she rents out her spare room on Airbnb, after breaking up with her live-in boyfriend. Isobel has to make some sense of her life, her newly shifting sexuality and uncertain prospects, all with the help of her trusty BFF, Cam, by her side. Of course, her relationship with the vibrant and eclectic Cam isn’t all sunshine and roses. There’s that time when Cam maybe picked up the girl Isobel was trying to date, among others. But when Isobel’s kicked out by her landlord, they decide to move to New York and change their lives. Together. Of course it’s not that easy, and season two has shown how hard it is to find the new-you when you’re clinging to the old one. And what happens when the person you lean on the most stops being there for you? They flip the story and now it’s Isobel, entering people’s lives for brief moments, trying to find herself and her home in the strange New York City. A French-Canadian drama, Féminin/Féminin is as much about the community of queer women as it is finding out who you are when everything changes. A divorce, cancer, a girlfriend who has a boyfriend, a first love who has transitioned, and of course, hockey. An ensemble piece, Féminin/Féminin takes the time to bring us into the lives of a group of six Quebecois women who are different and yet make a family together. A play on Jean-Luc Godard’s film, Masculin/Feminin, we enter the lives of these women via a faux-documentary and focus on their day to day lives. There’s moving, a group vacation, ice cream, and a cute baby lesbian at the ice cream store. And that’s just in the first 3 episodes of season two. Where other shows might attempt to sensationalize the queerness, director Chloé Robichaud embraces the reality of how these are just women, living their lives, loving other women. It’s never that simple, naturellement. We’ve also got the awkward May/December romance that no one seems to understand, returning exes, and the kind of drama that happens organically when everyone knows each other. But just like with Strangers, in Féminin/Féminin we explore the meaning of self and the strangeness within ourselves. That’s the heart of these shows. The essence of feeling ‘different’ and how it changes our interactions with the world. And the creators, Mia Lidofsky and Chloé Robichaud, both strove to tell stories about their lives and their worlds. For example, Mia actually is also bi-coastal and lets out her New York apartment as an Airbnb. 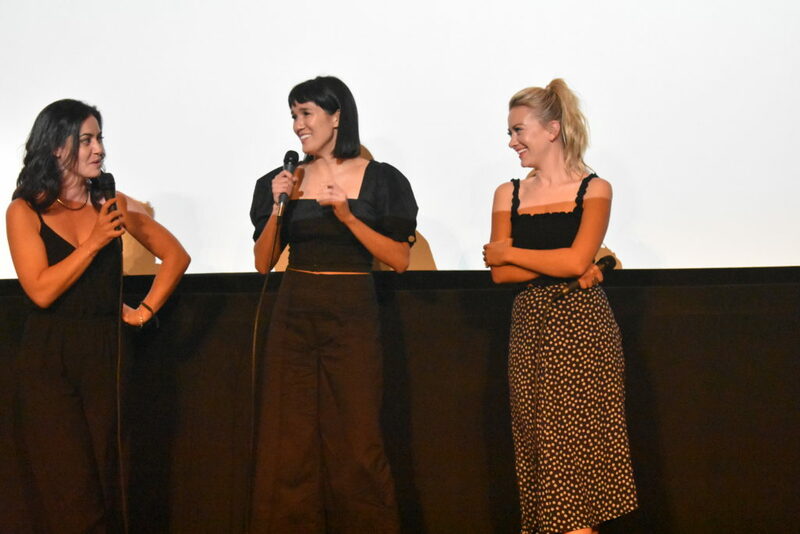 Three of the actresses, Kimberly Laferriere, Zoë Chao, and Meredith Hagner were present for a Q&A after the airing. They talked about how the three of them came to their shows all through past connections. Laferriere had met Chloé Robichaud at TIFF, while Chao had known creator Mia Lidofsky since nursery school and Hagner had similarly been friends since before she’d been an actress. They also feel that it’s important their characters are all written as real, fully developed characters. At the end of the day, these are three-dimensional [characters] who exist in the world, and the hope is that people believe that they do. Adhering closely to their creator’s visions, the shows both manage to be incredibly consistent and bring voice to the subject matter without being overwhelmed by their worlds. In the case of Strangers, the actors have to compete with their third co-star, the city of New York itself, who is indeed larger than life. Both shows were able to benefit from a much larger budget in season two. Féminin/Féminin needed this in order to get all twelve people in the right shots, while Strangers needed to fit in NYC as well as a writer’s room. The extra money gave them all the freedom to grow properly and organically. One of my big thoughts about these shows, which are both made by openly queer creators, is that representation now is so much more than just having shows about queer characters. As seen with The CW’s recent push to cast a queer actress as the titular Batwoman, there is a desire to have queers play queers, and with Féminin/Féminin they have cast an openly trans actor to play their trans character. But at the same time, it often feels as if that’s as far as TV is willing to go. They will cast a trans actor, but few trans actors are given the opportunity to make the jump and portray cis characters. With that in mind, I asked the actors the big question. Did they, who all identified as heterosexual, feel it was important to have queer actors play queer characters? I identify as straight, and my bisexual sister tells me “There’s no shame in that, Zoë.” But it’s something I’ve really grappled with, playing this part and wanting to play it as responsibly as possible. […] While I don’t necessarily know all of the ins and outs, personally, I do identify with what it’s like to marginalized, and to be a woman of color and not be considered the mainstream. I think it’s really rad that Mia [Lidofsky] and Facebook and Refinery and Beachside have foregrounded a bi-racial, bisexual protagonist. In talking to Zoë afterwards, it was clear to me that this is something she thinks about in her portrayal. She brings that ‘otherness’ which our culture forces upon those who aren’t cis, white, heterosexuals, and shares that in a way that is honest and reflective. Like me, she shares the two-sided appreciation of how we have listed almost 1000 shows. On the one hand, wow, 1000! And on the other … why only 1000? If you’ve caught up with Strangers, the third episode addresses some of Isobel’s blindspots and how even being a bi-racial minority, she too has her moments of privilege. You can watch Strangers on Facebook, and Féminin/Féminin is on ICI (which is in French only). Those of us who are iffy to terrible at French, good news. The show will be available to American audiences, complete with subtitles, in two weeks. Keep an eye on their official Instagram for more news!